Animal Defenders International : Animal experiments : Ill informed “scientific” opinion fails primates in research. Ill informed “scientific” opinion fails primates in research. As part of a review of the European Directive on animals in research, the European Commission requested the Scientific Committee on Health, Environmental and Emerging Risks (SCHEER) to update its previous opinion on the use of primates in research. ADI submitted evidence to SCHEER illustrating how the use of primates in experiments is scientifically unnecessary, particularly in research areas previously identified as “essential”, such as toxicology, infectious disease research and neuroscience. After SCHEER published a Preliminary Opinion we produced further comment including concerns that a timetable for phasing out primate use was omitted, the repeated use of unsubstantiated claims about the necessity for primate experiments, and misuse of the term “replacement”. The final opinion was published in June 2017 and the information presented is ill-informed, misrepresentative of primate use and a manipulation of current evidence on the benefits of primate research. The Committee are deceiving both the public and the European Commission, who will use the opinion to revise the Directive, that the continuation of primate tests is a necessary evil. The scientific evidence suggests this is not the case. 1. SCHEER say it would be “difficult” to establish a timetable for the replacement of primates, despite citing studies outlining primate replacement opportunities and referencing other timetables for the phase out of primate and animal use. 2. The term “replacement” is misrepresented with the use of mouse models and pigs listed alongside non-animal technologies as alternatives to primate use. This significantly distorts the definition of replacement as understood by the public. 3. Furthermore, suggesting the use of other species instead of primates is a futile point, as it is already a requirement of EU law that research on primates is only conducted when they use of other animals can be “justified”. 4. SCHEER make the misinformed claim that primates are “generally considered” to be the best models because of their similarity to humans, but provide no supporting scientific evidence. 5. Consensus on the need for primate use in “certain sections of the scientific community” is taken as evidence that some primate research “remains essential”. SCHEER turn a blind eye to evidence provided by other sections of the scientific community which conclude that primate use provides little benefit to human health. 6. SCHEER highlight the need to assess human benefits against harm to primates, but do not acknowledge that humans are harmed by adverse drug reactions, disastrous drug trials and failed drug development, when reliance on animals is made. They present a biased case focussed on the ethics of using non-human primates rather than the scientific evidence that they make poor models for humans. 7. Despite citing that several studies found a lack of HIV vaccines after many years of primate research, SCHEER go on to reference one, wrongly interpreted example of an HIV model for a very particular type of non-progressive disease in children. The very general assertion that primates have been “essential” in HIV research and therapy development remains scientifically unsubstantiated. 8. Unsupported claims are made about the “essential” need for primates in infectious disease research like HIV, malaria and TB because they are “better” than other animal models. 9. The opinion cites a review of primate use which finds that small biological differences may influence the reliability of them as research models. SCHEER suggest that these differences may be of help to study disease, wilfully ignoring the conclusion of the cited study that this suggestion is “unconvincing and, ultimately, unhelpful”. 10. Although SCHEER acknowledges the problem of attempting to validate non-animal methods against animal models, which have never been systematically assessed, they also infer that this needs to be done before a timetable for primate replacement can be implemented. Information appears to be cherry picked or ignored, depending on whether it supports the committee opinion. 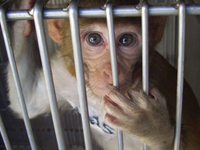 Urge your MEP to support measures to phase out the use of primates in research. Support our campaigns to stop primate testing. Write to the European Commission, urging them to take steps to phase out primate use in research.